Figure 1. MCC’s have two distinct genetic subtypes. These subtypes, MCC-LO’s and MCC-HI’s, have fewer and more mutations than any epithelial cancer sequenced by The Cancer Genome Atlas, respectively. We have used exome sequencing to identify the genetic basis of Merkel Cell Carcinomas (MCC’s). We performed exome sequencing of over 60 MCCs and matched normal blood. We identified two genetically distinct subtypes of MCC. One subtype is associated with Merkel Cell Polyomavirus (MCPyV) and harbors fewer mutations than any epithelial cancer sequenced by The Cancer Genome Atlas (TCGA). The other subtype is virus negative and harbors more mutations that any cancer sequenced by the TCGA. Figure 2. Statistically significant mutations in TP53 and RB1 in MCPyV-negative MCC. We found rare mutations in genes predicted to activate the PI-3-Kinase pathway in both subtypes of MCCs. 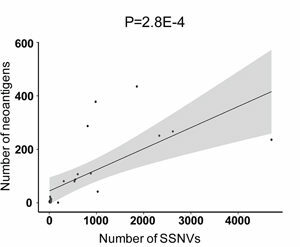 In addition, careful genetic analysis implicated TP53 and RB1 as statistically significant driver genes in MCPyV-negative MCCs. 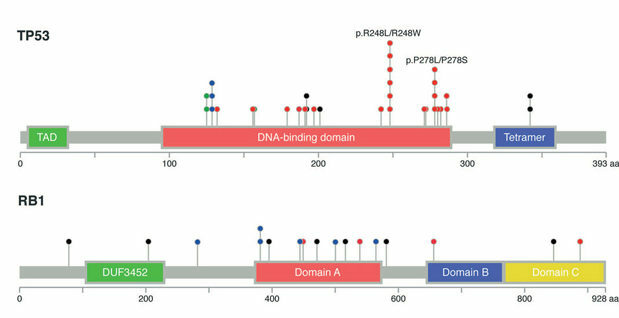 Interestingly, the mutations in TP53 clustered at UV-hotspots that are predicted to be gain-of-function mutations. Lastly, we found recurrent mutations in putative tumor suppressors involved in chromatin modification or the DNA damage pathway specifically in the MCPyV-negative MCCs. Figure 3. MCPyV-Negative MCCs Harbor a High Number of Putative Tumor Neoantigens. 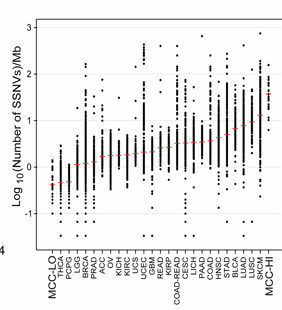 Most importantly, we found that the high mutation rate in MCPyV-negative MCCs correlated with the predicted neoantigen burden. These data collectively suggest that both subtypes of MCCs would be immunogenic. The virus positive MCCs would express viral antigens, and the virus-negative MCCs express a high burden of tumor neoantigens. These data have been borne out in subsequent clinical trials. We and colleagues are working to use these data to identify the tumor antigens in MCPyV-negative MCCs.